Seneca High School shined a light on mental illness Friday, May 13 at its annual Glow Run. The 5K was a extremely successful, and Seneca students raised $2,000 to donate to NAMI FACE (Burlington County Chapter) which is affiliated with the nation’s largest grassroots nonprofit organization for mental illness, NAMI (National Alliance on Mental Illness). The Psychology Club at Seneca, with its advisor, Social Studies teacher Mr. Sean Kennevan, worked hard to pull off the impressive event. The Glow Run was an approximate 5K at night outside at Seneca with the fun and games held indoors. The activities included glow games such as Kan Jam, volleyball, and badminton, with delicious food, exciting glow paint, and even a live band. With the abundance of games and activities to participate in, there was never a dull moment. Additionally, there was also the importance of raising awareness of mental illnesses and breaking down the stigma associated with mental illness. The students of Seneca High School wanted to take action and help those in need so they chose to “make a difference” — a phrase that doubled as their motto. The Psychology Club was formed in 2015 when they hosted the first Glow Run. 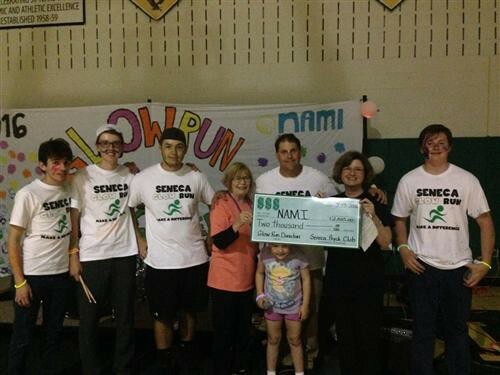 Last year, the Glow Run raised $1,500 to donate to NAMI. Continuing the success, the Psychology Club decided to make the Glow Run an annual event. Clearly, with donating just $3,500 in two years, the Glow Run is here to stay and can be anticipated to be an exciting event for the community to look forward to every year. The students and faculty involved are very passionate about it. The event is open to anyone and everyone. Watch for notices about next year’s Haunted Glow Run in the fall, scheduled for Thursday, October 27, 2016 and ask about how to get involved in shining a light on mental illness. Story courtesy of Julia Collins, Class of 2018.